Michel Herbelin has taken inspiration from 1970s seaside glamour for the 2018 Newport Classic collection that the French watchmaker says makes a strong, yet restrained style statement with its subtle contemporary take on vintage design. The watches come in a 38mm cushion-shape that uses polished steel for their cases and bezels. Slender white Roman numerals stand out against a deep blue lacquered ground dial with nickel hour and minute hands with luminescent coating. The watches have a double aperture large date at 12 o’clock and a small seconds subdial at 6. Michel Herbelin has opted for a Swiss-made Ronda quartz movement with a crown engraved with a ship’s wheel. 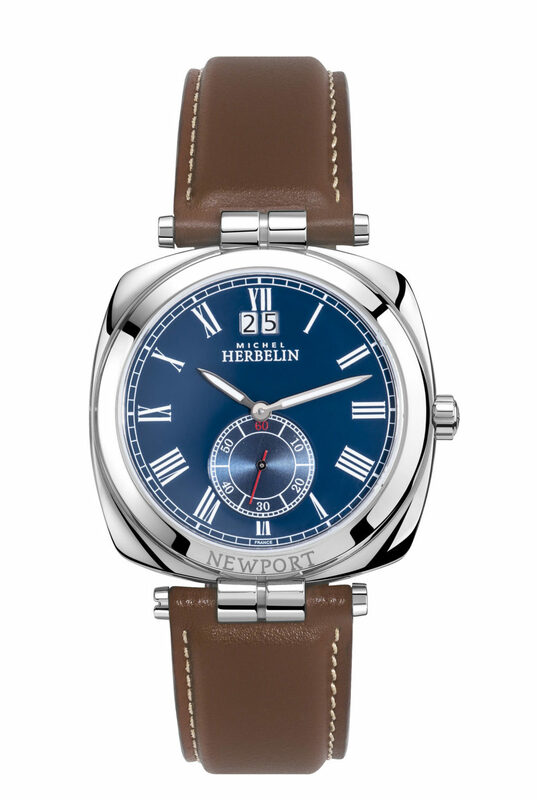 The Newport Classic is worn on a brown leather strap.